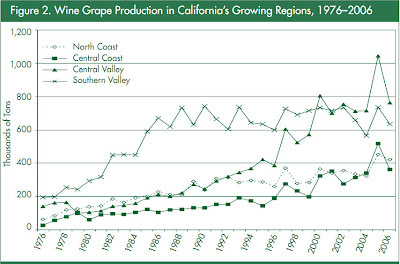 A study released today from Stanford University, aka Global Warming Central, claims the California wine industry will collapse due to global warming, despite the marked increase in California grape production of approximately 400% along the North Coast, 2500% along the Central Coast, 1500% in the Central Valley, and 800% in the Southern Valley of California over the past 30 years of global warming. In the next 30 years, high-value vineyards in Northern California could shrink by 50% because of global warming, according to a new Stanford University study released Thursday. Applying scenarios from the Intergovernmental Panel on Climate Change, scientists used a climate system computer model and found that Napa and Santa Barbara counties could experience very hot days during the growing season, with temperatures reaching 95 Fahrenheit or higher. The number of hot days will be greater, they say, with about 10 more sweltering days than usual. 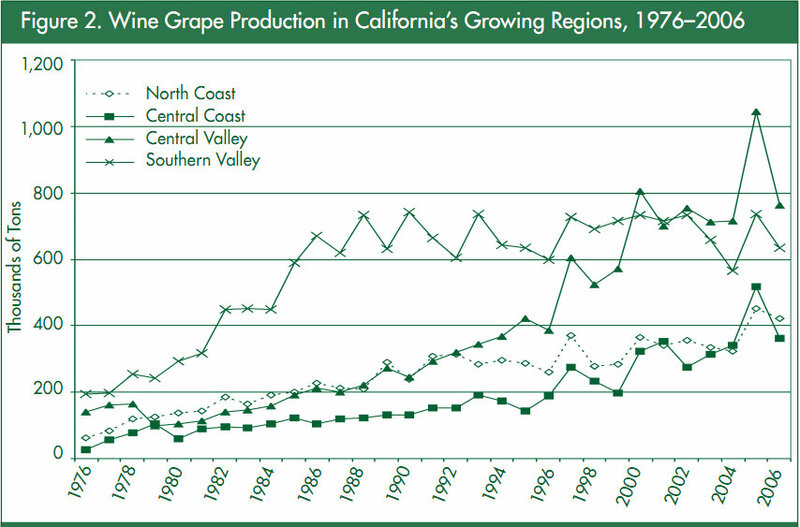 As a result, the amount of grape-growing land is projected to decline over the next three decades, the authors wrote. "There will likely be significant localized temperature changes over the next three decades," said Noah Diffenbaugh, coauthor of the study and a center fellow at the Woods Institute for the Environment at Stanford. "One of our motivations for the study was to identify the potential impact of those changes, and also to identify the opportunities for growers to take action and adapt." High-value growers in California may need to take into account warmer weather and integrate climate information into their cultivation and practices, Diffenbaugh said. Two counties that he found would have cooler temperatures, Yamhill County in Oregon and Walla Walla County in Washington, can prepare for more optimal growing seasons. "It's risky for a grower to make decisions that consider climate change, because those decisions could be expensive and the climate may not change exactly as we expect," Diffenbaugh said. "But there's also risk in decisions that ignore global warming, because we're finding that there are likely to be significant localized changes in the near term." The peer-reviewed study, which has yet to undergo the scrutiny of the larger scientific community, is based on the Copenhagen Accords greenhouse gas target of 2 degrees Celsius above the pre-industrial baseline, or about a 23% increase in atmosphere gases by 2040. This could raise the average global temperature by 1.8 degrees Fahrenheit, a conservative scenario, said Diffenbaugh. Researchers compared the computer model’s simulations with actual weather data collected between 1960 and 2010 to see if their model could accurately replicate past temperatures. They combined new and historical data and found that all four counties were likely to experience higher average temperatures during growing seasons. Certain varietals, such as Pinot Noir and Cabernet Sauvignon in Napa Valley, grow at average temperatures of 68 F, with fewer than 30 hot days. But with temperatures projected to rise by 2 degrees and 10 more hot days, hospitable conditions for growing would decrease. On the other hand, Yamhill and Walla Walla counties will see more land suitable for high-value varietals. These projections could have a large effect on California's $16.5-billion wine industry, which with more than 500,000 acres of vineyards, produces on average more than 5 million gallons per year and accounts for nearly 90% of the nation’s total wine production, according to the Wine Institute, a state winemakers trade organization. Perfect example of the real world and the world of make believe models. Data vs guesses. Is there anyone that knows climate well enough to be able to model it? diffenbaugh@stanford.edu <---- contact info for the fraudster. We are wine growers in Sonoma County. This is the coldest and wettest in our 8 years here. Key to this is that they "suggest" we plant heat tolerant varietals. That will become a mandate in replanting permits. A "scientific" study is all the excuse regulators need. What they are after is control of the water, especially water for frost protection, which is needed for early-budding cold weather varietals - get it? Marxists do stuff like that. They are even after irrigation water, trying to take our fresh sources and force us to use treated wastewater. Yummm! Already they limit how long our trucks can idle because of CO2 output. Next they will notice how much CO2 fermentation puts out. California is not committing economic suicide. The rank and file hippie is a carbophobic class-hater, but for the leaders this is a political expulsion. They are willing to scorch the earth to do it. Ask the farmers in the Central Valley.